Mason Crane in action for Hampshire last season. Mason Crane became the first overseas player to represent New South Wales in over 30 years last night. The 20-year-old former Lancing College pupil was included in the Sydney side’s team for their Sheffield Shield match with South Australia at the SCG, which started on Tuesday. Former Pakistan captain Imran Khan was the last player to represent New South Wales from foreign shores back in the 1984-85 season. 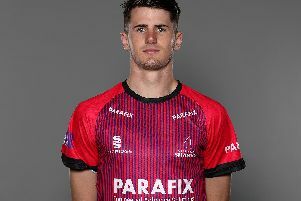 Hampshire leg-spinner Crane, who came through the ranks at Worthing Cricket Club, has impressed during his spell as an ECB overseas placement player. Crane has made a number of appearances for Gordon Cricket Club in Sydney Grade games, while also producing some good spells in the nets with New South Wales, before his inclusion in the first XI for the four-day game. Former Australia international leg-spinner Stuart MacGill has also been working with Crane over the course of the winter. ECB’s lead spin-bowling coach Peter Such believes his inclusion in the team is a massive achievement for the young leg-spinner. He said: “It’s a fantastic achievement for Mason. Australian state teams don’t tend to pick overseas players lightly, especially New South Wales, as the records show. “He’s managed to force his way through with a weight of wickets, while making an impression during some practice sessions with New South Wales. “Mason has excelled in grade cricket for Gordon taking a seven-wicket haul in three consecutive games.